Signed Expressionist Painting of a Rooster (2017) from Bali, "Fighter I"
Standing tall and proud with its head cocked to the side, a majestic rooster fills the canvas in this impressive painting by Bali's Wayan Suarjiwatman. 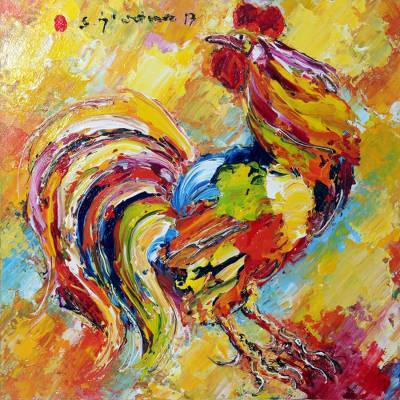 He carries on the artistic spirit of his grandmother, capturing the rooster with bold strokes of the palette knife that create a kaleidoscopic, colorful composition in the expressionist style. Let this original painting bring majesty and beauty to your home.